Special car loans for electric or hybrid cars reward customers for making environmentally-friendly choices with an array of attractive benefits. In another effort to support the sustainability objectives of the Qatar Vision 2030, Doha Bank, one of Qatar’s largest private commercial banks, has announced a special Green Car Loan offer to encourage residents to opt for environmentally-friendly vehicles. Encouraging customers to become more energy efficient and sustainable, with their Car options the exciting offer features discounts on interest rate on Car loan, that are electric or hybrid car. 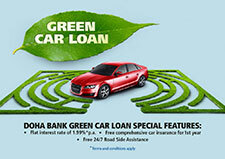 Green Car Loan is available for select new and pre-owned electric and hybrid car models, Doha Bank’s Green Car Loan allows customers to take advantage of special features including a flat interest rate starting at 1.99% p.a. (reducing rate of 3.75% p.a. ); complimentary comprehensive car insurance for the first year; complimentary 24/7 roadside assistance from Doha Bank Assurance Company and a pre-approved instant personal loan among other benefits. As an active environmental advocate, Doha Bank has a long history of organizing and supporting green initiatives as part of its Corporate Social Responsibility (CSR) efforts. Throughout the year, Doha Bank hosts a series of annual events aimed at promoting environmental action and responsibility including the Al Dana Green Run, one of Qatar’s largest community events, the Beach Clean-up campaign as well as a Tree Planting activity. In addition, the bank’s ECO-Schools Programme is designed to encourage and support schools to proactively participate in the implementation of good environmental practices, reduction of carbon footprint and increased eco-consciousness.